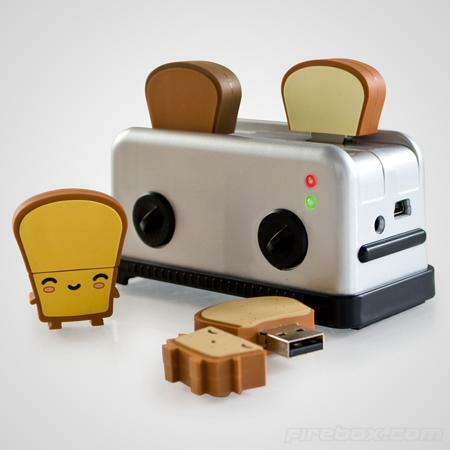 I know that it is elections fever over here in the US, but if there was a vote opened up for the cutest and most adorable USB hub as well as USB flash drives in the market, chances are I would put my money on the USB Toaster Hub and Drives. You will be able to choose from four different USB flash drive designs of 4GB each – Butta, Crisp, Ry Ry and Tato at £12.99 a pop, while the USB Toaster Hub itself will retail for £17.99. Heck, the USB Toaster Hub comes with an SD memory card slot to boot for expansion purposes, allowing you to transfer files about and to manage your data right on the spot. Nice to know that the individual USB ‘toasts’ come with their very own character and color, not forgetting to mention different facial expressions. It would be interesting to see how one is going to remember the kind of information stashed away on Tato, Butta, Ry Ry and Crisp. Too bad this is a USB 2.0 product, so it is not exactly future forward, but it will do for the majority of us out there.